← Art + Food + Brew Your Own Beer Workshop + Conversation = Eat Art! Dark chocolate cake with maple bourbon cream cheese frosting with bacon and caramel sauce. Photograph by Andrea Patton. Something great happened in New York State this year. 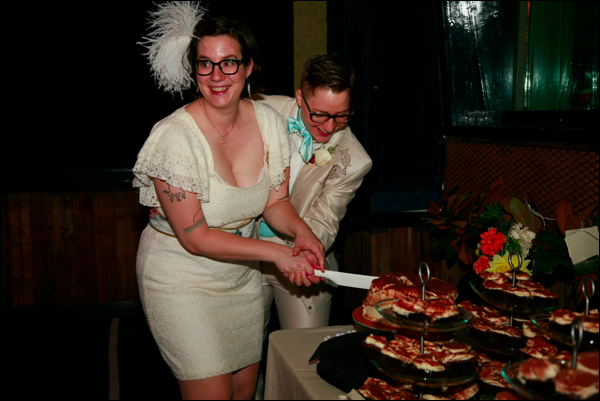 Our friends Lydia and Billey got married and I got to make the wedding cake and cupcakes! Oh, yeah, and New York State legalized gay marriage! Whether you want to get married or not, marrying the person you love should be a legal right available to all, not least because you get to throw a huge, fun party, invite all your loved ones, and eat really good cake. 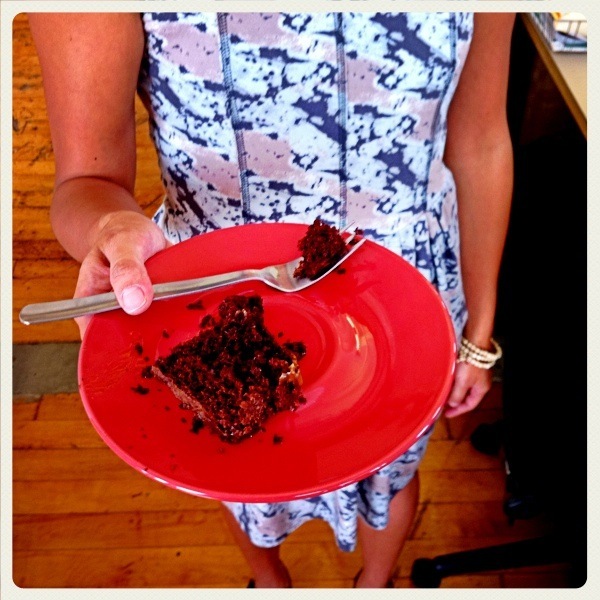 The cake is what this entry is about. When Lydia and Billey, two of the librarian movers and shakers behind the Desk Set, announced they were getting married we were thrilled. When they asked us to make their wedding cake we were even more thrilled. 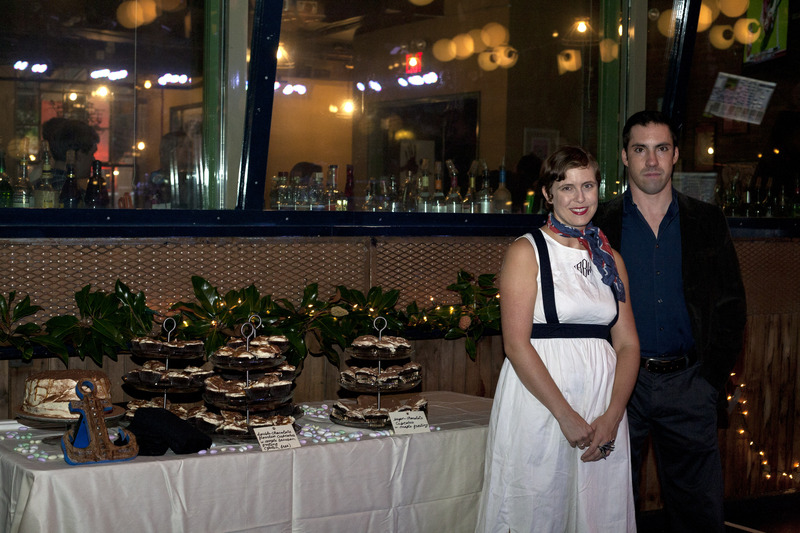 When they explained they wanted a “normal” sized cake for themselves and cupcakes for the guests we were really happy. We have a “normal” sized kitchen (for New York) and do not have the patience to create a multi-tiered wedding cake. 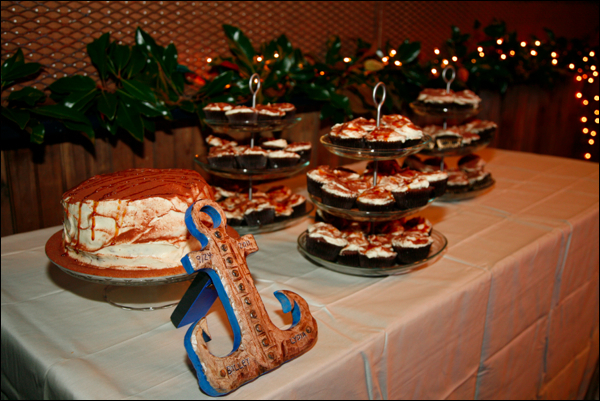 This was the first time I had ever created a confection for something as important as a wedding. So, wanting be the good and attentive cook that I am I emailed them. “What flavors do you like?” I asked. “Caramel. Bourbon. Bacon. And dark, dark chocolate,” came the reply. Gauntlet officially thrown. 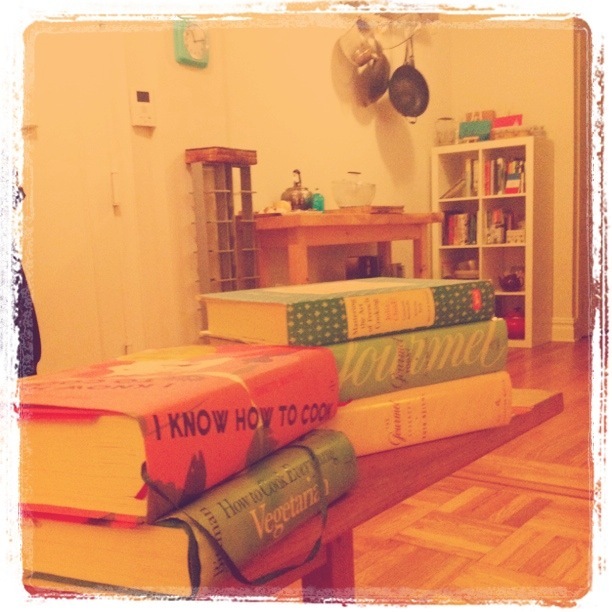 Just between you and me, blog readers, while I love cooking, I find baking a little bit intimidating and fussy. However, I also love a challenge and once I have committed to something I will not back down. 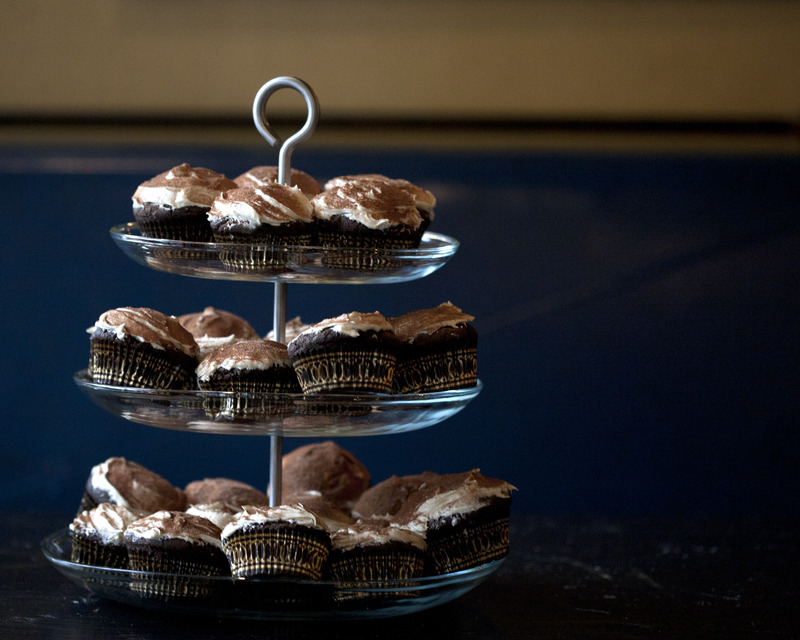 Vegan chocolate cupcakes with maple frosting. Photograph by Andrea Patton. The best way to succeed at something new is to research it thoroughly. I stacked up all my cookbooks and went through them methodically, reading about making chocolate cake and different kinds of frosting. I decided that the chocolate cake had to be rich and versatile. I decided buttercream frosting was too fussy, but this still left a wide variety of cakes and frostings to try. After reading through my cookbooks I marked recipes I thought might work. I also did some brainstorming and drew a diagram to figure out how to get the four flavor combinations into the cake. I thought: Dark chocolate cake, of course, that is the easy part. But, if the bourbon goes into the cake itself its flavor will get lost in the baking process, so best go into the frosting. The caramel could go into the frosting too, but once I started reading about caramel frosting I decided that that was far too fussy. So, what about just a caramel sauce? And where did that leave the bacon? Baked into the cake the bacon would create a strange texture and crumbled on top it would be a strange look. Plus, somehow the layers of the cake had to stick together and taste coherent. I decided to structure the cake with four layers with a cream cheese, bourbon and maple frosting. The bacon would be cooked crisp, chopped up, mixed with caramel sauce and spread between layers. I realized that to find the perfect cake for my friends’ perfect day I would have to do some serious testing. I am lucky to work with a group of accomplished cooks and foodies, so I told them about the wedding and I asked their advice. 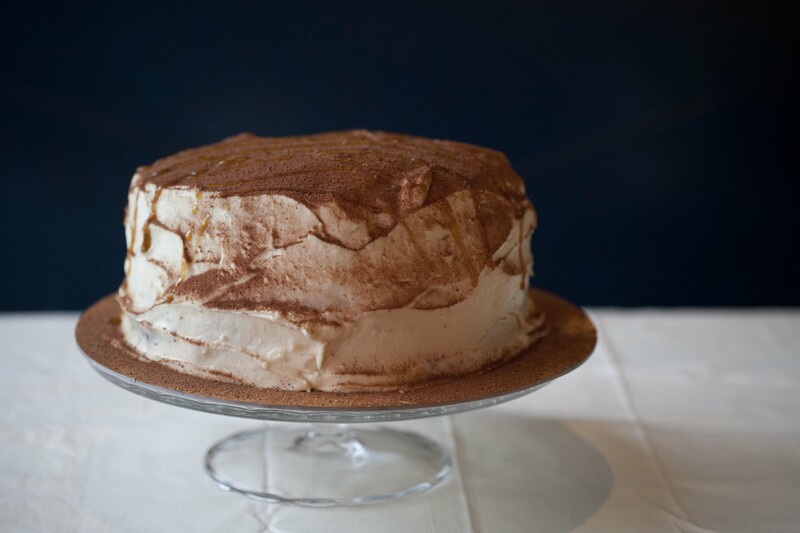 They told me to: use semisweet Valrhona chocolate, try a recipe with mayonnaise, experiment with cream cheese frosting to counteract the sting of the Bourbon and to take a visit to New York Cake and Baking Supply. I also employed my co-workers as pro-bono testers (when you are plying people with chocolate cake it is not too hard to find volunteers). I tried 4 different recipes: chocolate cake with mayonaise, chocolate with sour cream, chocolate cake with buttermilk and flourless chocolate cake. 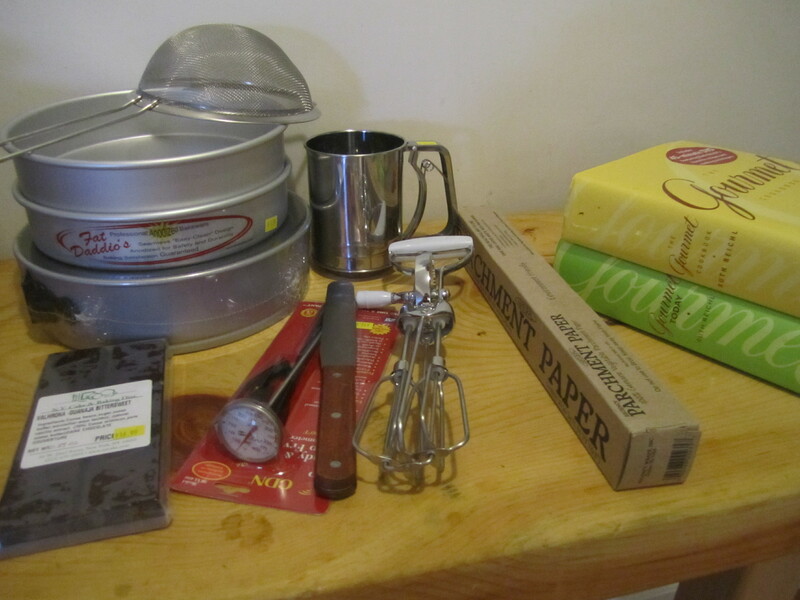 I visited New York Cake and Baking Supply for the first time and from this magical emporium I got round cake pans, a spring form pan, a sifter, a sieve, parchment paper (my new favorite thing because it takes all the worry out of baking! 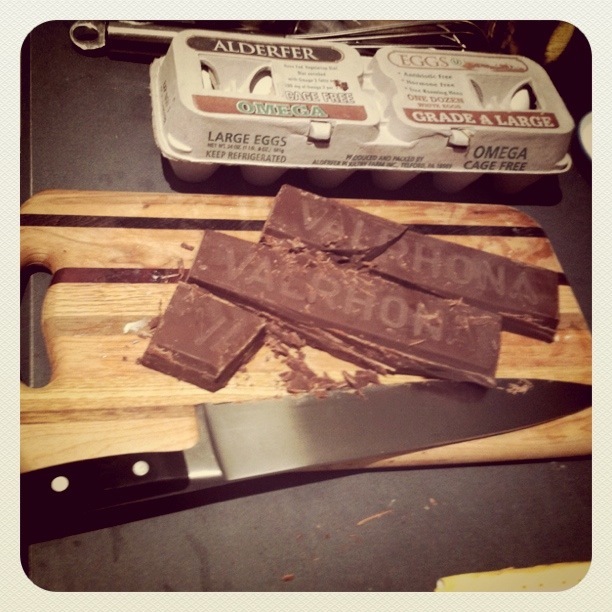 ), Valrhona chocolate in bulk, squeeze bottles, cupcake wrappers, and frosting implements. This store is a fantastic institution of creative and tasty New York. I hope that they don’t get priced out of fancy Chelsea, because their cramped aisles full of every baking implement imaginable are full of inspiration for New York chefs. When I wandered through that cramped store I started dreaming of all the things I could make and that is not the same feeling I get when I am fighting it out with college kids in a megastore like Bed, Bath and Beyond. Four cakes later here was my verdict: the mayonnaise cake was good and held up well, but a little too dense for a wedding cake; the buttermilk cake would have been perfect for a birthday cake, but the crumb was too big for a wedding cake; the flourless cake was so chocolately all the other flavors were lost, but was perfect for individual cupcakes because it packed a punch of chocolate; and the sour cream cake was perfect: it was sturdy while being delicate, chocolately and light with a small sized crumb. I also had to figure out how to make caramel sauce. I found a recipe in Gourmet cookbook. Easy enough, right? Trustworthy recipe, right? No! It gave all the wrong advice. It said to use brown sugar and stir vigorously the whole time, two big caramel no-no’s. Instead I burned sugar and nearly ruined a pan. 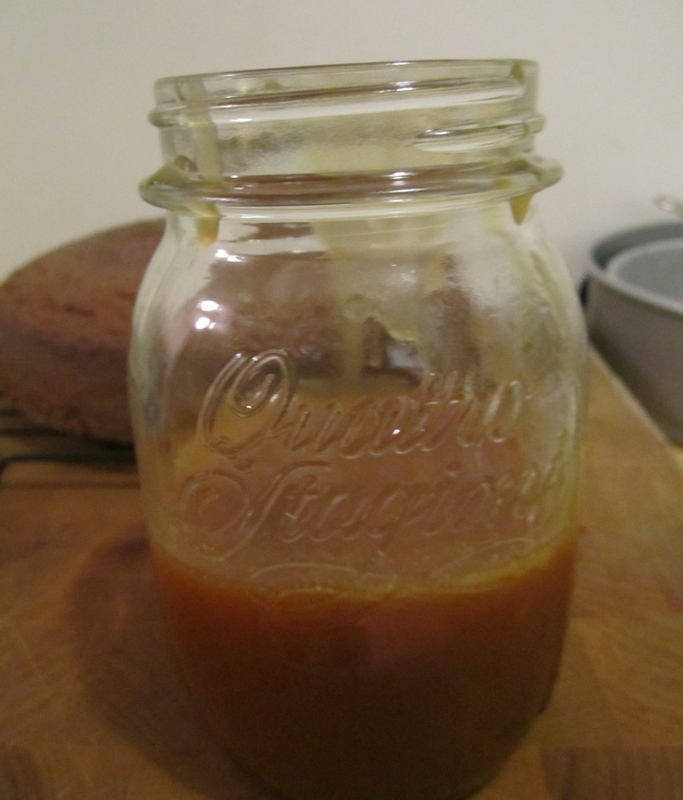 After lamenting my caramel failure to my aforementioned foodie co-workers they did some research and shared David Lebovitz’s ten tips for making caramel and Simply Recipes caramel sauce recipe with me. Duh, why didn’t I think of that! White sugar (the whitest you can find, kind of painful to buy for natural sugar hippies like me) and gently agitating the pan are the keys for caramel. David Lebovitz always saves the day when dessert is concerned. After much angst, caramel sauce! The week of the wedding was a busy one. I took time off from work to buy 12 boxes of eggs, 20 packages of cream cheese, and 10 pounds of butter at the Food Co-Op. While I was checking out a conversation sprung up between the member working the register and me about cupcakes, marriage equality and librarians. She check out volunteer was a librarian herself and she told me Melissa York from Team Dresch/the Butchies made the cupcakes for her wedding. The perfect check out worker for this project! “What a Co-Op moment,” thought to myself as I left. My pal Tracy lent me her Kitchen Aid mixer, which was a godsend, especially for the flourless cupcakes and the frosting. I mixed, I baked, I cooled and I made a huge bath of cream cheese Bourbon frosting with almost half a bottle of Evan Williams and pounds and pounds of butter, cream cheese and confectioners sugar. I also made a small batch of vegan cupcakes so that everyone could have some dessert to eat. Frosting the cupcakes before the wedding. Photograph by Andrea Patton. The day of the wedding we loaded everything in a car and frosted the cakes at the site of the wedding under the watchful camera of Andrea Patton. The wedding was beautiful. The cakes were a success. As the brides said, “This is like our dream cake.” One should have nothing less than a dream cake on a dream day. Congratulations Lydia and Billey and thank you for including us in a small part of your big day! Cakes, cupcakes, 2 cooks. Photograph by Andrea Patton. I drew most of my recipes from my Gourmet and Gourmet Today cookbooks, which I won at a Desk Set raffle, which is how I met Lydia and Billey. Full circle! For the cupcakes I used the “Flourless Chocolate Cake” recipe from Gourmet. This recipe is so easy! It’s a delight, but I do recommend using an electric mixer if you are going to make a massive batch of cupcakes – your arms will thank you! If you decide to make cupcakes instead of the cake reduce the baking time by 10 minutes. You know the cupcakes are done when they are kind of cracked on the top and a test toothpick comes out with crumbs clinging to it. I pretty much improvised on the frosting recipe, but this maple-cream cheese frosting recipe captures the ratio of cream cheese to butter to powdered sugar and I added 2 to 3 shots of bourbon to taste. If the frosting gets too runny from the bourbon add more confectioners sugar. For the vegan cupcakes I turned to my first and favorite basic vegan cookbook How It All Vegan for guidance. Preheat oven to 350 F. In a double boiler or a metal bowl placed over a pan of simmering water melt together the chocolate, margarine, vanilla, and soymilk. Remove from the heat and stir in the sugar. In a large bowl sift together the flour, baking soda, salt and cocoa powder. Add the chocolate mixture to the dry ingredients stir until “just mixed.” If too dry add 1/4 cup of water or soymilk. 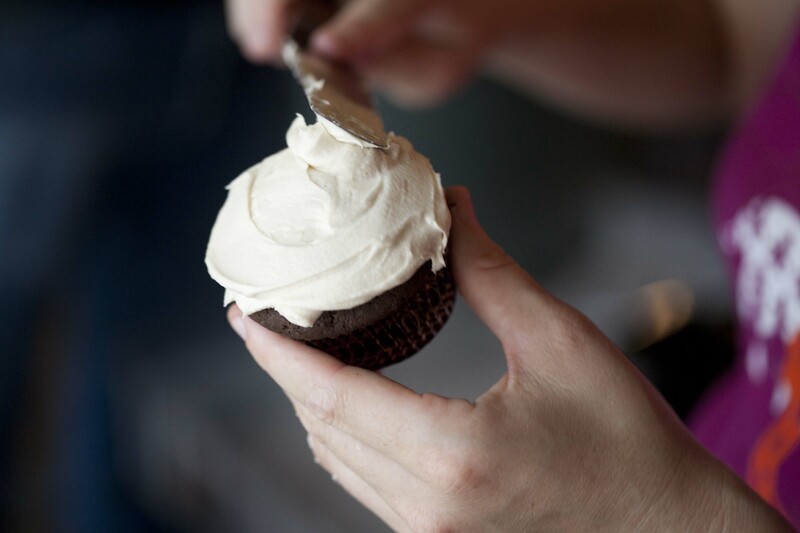 Pour into a greased pan dusted with flour (and lined with greased parchment paper) or into cupcake cups. Bake 30 minutes for a cake, 20 to 25 minutes for cupcakes and test with a toothpick to see if done. In a bowl, electric mixer or food processor cream the margarine and sugar, then add the maple syrup and mix until light and spreadable. Two cooks, one from Bushwick and a passionate meat-eater, one from Sunset Park and a former vegan, and both NYC transplants, set out to share original recipes that can be made dairy free and vegan deserts; showcase culinary resources in the outer boroughs (and sometimes Manhattan) where one can find unique, specific and fairly priced ingredients; and participate wholeheartedly in the many cultures of cooking and eating that make up New York City. 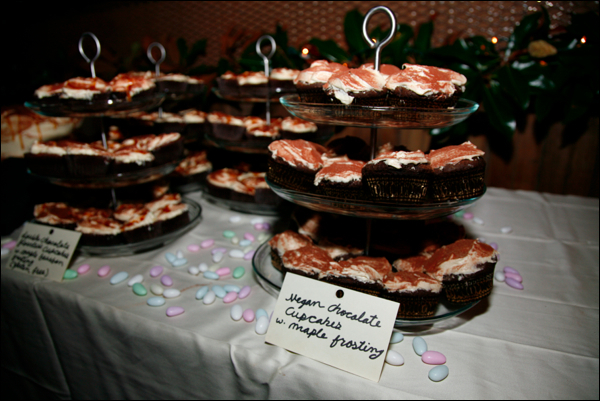 This entry was posted in Baking, Dessert, Recipe and tagged Bacon, Bourbon, Cake, Caramel, Chocolate, Cream Cheese, cupcake, Dessert, Frosting, Gourmet, Icing, Layer, Maple, New York Cake and Baking, Recipe, Sauce, Valrhona, Vegan, Wedding. Bookmark the permalink. 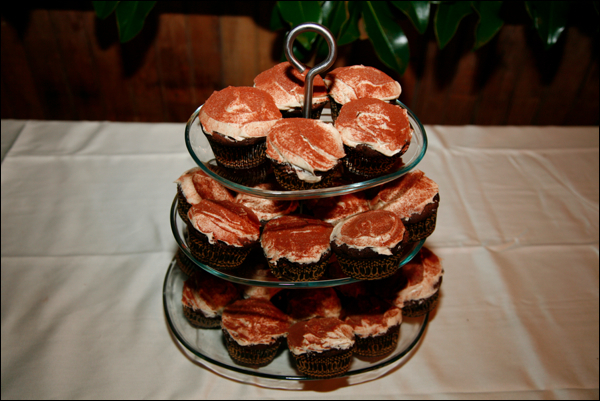 Those cupcakes were deeeelicious. Thanks for sharing the recipes! What a happy day that was. Thank you! It was such a special day and we were glad to play a small, sugary part in it!